Here it is Sunday night, time for bed (for me) and I realized if I don't start writing blogs, no one will ever want to follow us. However, when you have the internet connection problems that we've had and carry the schedule that we do and play Words with Friends on Facebook, time for blogging escapes. We had a wonderful dental clinic for five days, Stephanie Tamayo, my daughter in law was here as the Dental Hygenist. You know that was a treat for me!!! First family member to break the "I am not coming to Haiti mold" so now I'm looking for the others, but won't hold my breath! Olivier and Junior had their first birthday party ever and it was fun although, it took all day when there was studying to do for Bible school and my presentation on Saturday showed the lack of prep time. But, Junior and Olivier had the time of their lives as we joined with the orphanage kids, Al and Bev Carpenter, for a few hours at the beach , then back to the orphanage for hotdogs and cake, and presents (the best part). They are still running around here playing with their toys and just finished off the last of the cake after supper. These boys are the best. God really blessed us and we pray they continue to be obedient even as Junior turned 13. Grades are good, they are fun and we love them. In the throws of Christmas practice. Bethany Painter, volunteer , is teaching a dance to Joyful Joyful We Adore Thee, to the older kids. They are into it, no discipline problems there, all are striving to do it just right. Refreshing for me to say the least. A Christmas that did not depend on this aging brain to not only come up wtih an idea but also the execution of it. Ashley Longardner is working with the younger ones, and they are doing a great job as well. Kendra Swick is teaching the pre-schoolers a song and they will do their annual manger scene. Ahhh, Christmas! The tradition goes on. And Jesus really was born in a manger in Bethlehem, in case someone reading this has doubts. Everything needed to know is in the Bible. Thanksgiving will see our house rocking with people. The whole missionary community that we fellowship with on a bi-weekly basis!! It should be fun, because all I have to do is a turkey (we'll have two) dressing, and maybe a little of this and that. When I get started in the kitchen the ideas start popping. Sort of like the vision for Touch Ministries.....the more I think about it the bigger the vision gets. Who will carry on the vision? Not that I'm planning to go to heaven anytime soon, but turning 70 has me thinking there better be someone who joins us to carry this thing on. Watching our volunteers jump around and have extreme energy reminds me of a younger Carolyn but today, she's not jumping around but walking from here to the chair. During the Thanksgiving weekend there is a wonderful crusade going on in town and we will host some of the people who have come in. So that's our Thanksgiving weekend. Bible school fits there as well. Preaching on Sunday too. Never a dull moment when allowing the Lord to be Lord of your life. And we've started a Sunday church meeting on the days we don't have missionary meeting. It's really neat. Today there were over 15 so it's growing. Going to add some pictures. Thank you, Family Harvest Church for the great team you sent. It was awesome and for me a time with family and friends. The people will never be the same due to your love, care and ministry. Going to WV for Christmas, getting there just about at Christmas but looking forward to seeing family whom we miss so much. We are having a very successful school year. We are so thankful for the enthusiasm and skills that our American volunteers have! Their greatest asset is energy!!! Oh! How I wish for such. They never shirk at responsibility and spend their days off planning for the next week. Our children are exceedingly blessed this year. We have 104 students and each one is getting the love and attention they need to become good students. One day, they will be good citizens and hopefully lead their country out of the place where its been for so long. When school starts, I'm always thankful for the end of the first day. Here we are at the end of two and a half weeks. Amazing how quickly time goes, but also unnerving when one considers their age and the brevity of life here. It's also amazing how we have the honor of sowing into young lives, preparing them for an uncertain future but one filled with hope. I'm particularly thankful today for the opportunity to lead the older kids in worship and teach the Word to them. Some listen, others wish they could escape. We had two kids ask for prayer for healing after the lesson and that was a blessing because it was spontaneous, not because I prompted it. We are studying Jonah. There is so much more to Jonah than being swallowed by a fish. I am getting a lot out of the preparation for chapel. I've always heard that a teacher gets more out of preparation than delivery and it's quite true for me! All the children are having a good time. With the lower grades getting to dance and do crafts and pre-school experiencing all kinds of science and art, El Shaddai is second to none (in my humble opinion). Gary and I couldn't be happier concerning our volunteers. They are a blessing and a lot of fun. We are still talking to new students about coming to El Shaddai, so our enrollment at 80 is far from complete. Already, we see some challenges and this year in first grade, it's girls. Interesting. Ashley Longardner said she was so blessed to see that the first graders were able to complete their first Word Building pace. They did it. They all passed, on to the second one and a new letter sound. Junior has been relentless with his homework, and of course, Olivier follows. Work, work, work. I had to tell Junior to put his books away the other evening. Gary had moved him up ten paces because he felt he wasn't being challenged at the level he was working last year. Junior cried thinking he was in trouble. Then he decided to conquer it and has. He'll end up with a very high number of paces this year. Last year he did 106. Requirement is 60. (and a 99% grade average). Today he's working on his construction outside. Junior has been building a house. He does it the Haitian way, gets the dirt, sifts it, mixes it (as though it were cement) and constructs. It's quite a structure and quite ingenious. This looks very much like a Haitian house. He's working on this one, the dirt on top is wet. This takes a lot of time and thought. Bethany had a fight with a cockroach last night which kept her up most of the night. She made it up at 11AM. A few more pictures and I'm out of here. Here we are the fourth day of school!! Who would have thought in 2002, we would be here today doing that which began then. I remember Gary saying, "I don't want a school, I don't want anything to do with the school." So, with his permission, I started with two, then five and the following year we had 21. Needless to say, he joined in as there was no way I could do it alone. Now, he's really more involved in the ongoing process than I. This year, we ordered 11,000 dollars worth of curriculum. Our pre-school has a licensed teacher directing it. Kendra Swick is enjoying preparations for each day and the children are the beneficiaries of her plans. God knows how to plan and to carry out the plans. All we have to do is be faithful. Ever think about that? Our rent is going up on one building. As you know we use three rented buildings for El Shaddai. So, this is the year we are thinking, praying, planning for our own building. We must get out of these rental situations. We have our eye on a building that can be enlarged and we are waiting for approval and good papers on it. Once that happens, we'll begin to make it usable. It was once a church and has possibilities to be a structure we can use not only for school but for many activities, including Bible school. According to Blogger, they've updated their blogging. I'm going to post some pictures and see what happens. If it gets too frustrating, I'm outta here. Time is of the essence as I'm now the principal of the pre-school, kindergarten, first and second grade. It's more work than the classroom, but there is nothing wrong with work. We simply need to make sure our work glorifies Him. Gary and I have been in St Marc Haiti nine years. El Shaddai Learning Center is a Christian based English school for Haitian children, giving them an American education. We are not in the business of education but in the Lord's business. We give kids a future and a hope. We rent two buildings for our school program. We started with five children and have 70 to date. We give over 5,000 meals to children a month,and we fed over 1,000 children at Christmas. We have a Bible school in Montrouis that we teach weekly. Our second graduating class is May 29th, 2010. Our current need is for teachers at El Saddai. The requirements are: You are a Christian, you love the Lord, you love children, you can read and write. 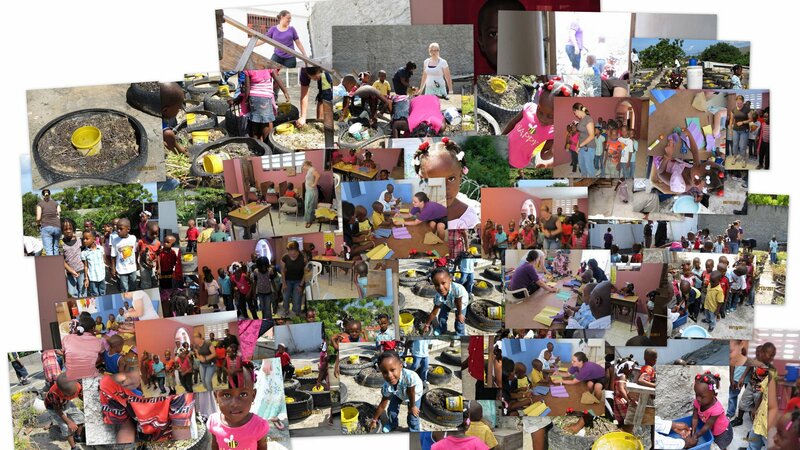 Anyone interested in a mission trip to Touch Ministries can arrange that by contacting us at wwgm_cgwalker@yahoo.com. Anyone wanting to help a child get an education can send a tax deductible gift to Touch Ministries, 417 Rebecca Street, New Martinsville, WV 26155. Welcome to our blog about the sights and sounds, people and places, ministry and visitors to the vineyard where God has placed us. There are times we think He's placed us here and there are times when we aren't sure but we keep plugging along and hope we bear fruit that will remain. If you are curious about Haiti or want to see first hand what we do, we invite you to join us for a week, month or year. We guarantee one thing, you may not change Haiti, but Haiti will change you! Hopefully, it will be for the better. Oftentimes, we take our lives for granted and expect everything to be just as it is. That doesn't happen in Haiti and we've come to understand that life can be lived in day tight compartments with a grateful heart to the King of Kings for giving us this day filled with opportunities to bless someone else.